"This is like my Birthday!" This is what my six-year old son said when we opened up the package from Crayola. He was thrilled to see all the goodies but noticed that it was addressed to me – so he thought they were mine. After I told him they were his, he was immediately ecstatic again. He took each item out of the box like he’s never seen crayons or markers before. It really was cute. My son said his favorites are the Crayola Window Crayons and the Crayola Color Explosion Black Extreme Surprises. My french doors are covered with his beautiful creations and my fridge is covered with more than a half dozen works of art created using these great Crayola products. According to my son (and the only negative thing he had to say), the Tadoodles Washable Crayon Buddies were for babies – and he’s a big boy. However, my sister-in-law is expecting a baby in December so we’ll give them to her. 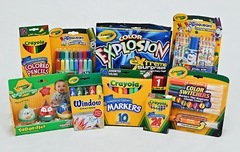 This Crayola CreativityCast – provides hours of fun for any child… from the young to the young at heart. The name Crayola is trusted, tried and true. We love Crayola in our house and are certain that you do too. My son says that you should get the Window Crayons and the Color Explosion Black Extreme Surprises for your sons and daughters. Oh, and he says all the Crayola gifts he received are "cool", he just likes those two the best. 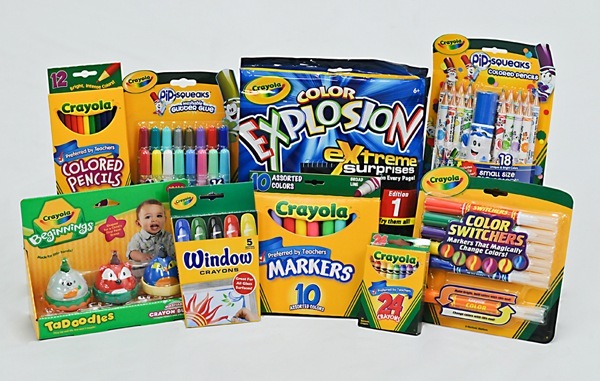 All these Crayola products make great gift ideas for birthdays or Christmas. What better gift than to provide a child with tools to exercise their creativity.